Several elements of the POS Integration Settings are managed on the 'Miscellaneous' tab of the 'Preferences' screen. Doing so will open the 'Preferences' screen in a new tab. Upon loading, navigate to the ‘Miscellaneous’ tab to make any desired adjustments. 2) Discount Combined in JE - This setting combines any Discounts with the corresponding Sales represented to make a single transaction line item on the DSS Journal Entry. This is unchecked by default. It is recommended that this setting remain unchecked. 3) Payment Type Separation - Payment Types are imported from the POS System and reflect the manner in which payment is received on a Sales Ticket. Payment Types must be mapped to a GL Account and Payment Group for DSS review. 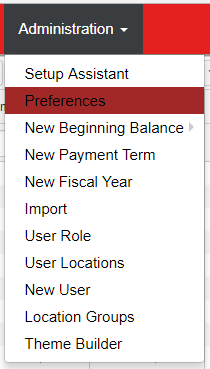 Note: Changing this setting after the initial POS Mapping has been completed will result in new Payment Types being created. These Payment Types would then need to be mapped as previous Payment Types would no longer be in effect. Additionally when a setting other than 'None' is selected, changing the Legal Entity or Location Name will result in new Payment Types being created, requiring each new Payment Type to be mapped. Legal Entity - Each Payment Type will have the Legal Entity Name appended to the end of the Payment Type Account Name. For example: 'Visa' would become 'Visa - Legal Entity Name' etc. Location - Each Payment Type will have the Location Name appended to the front of the Payment Type Account Name. For example: 'Visa' would become 'Visa - Location Name' etc. 4) Menu Item Separation - similar to the Sales and Payment Type separation, Menu Item separation allows you to separate each menu item by Location, Legal Entity, or custom Location Reporting Category. The default setting is ‘None’ and will be sufficient for the majority of restaurant groups. This setting should only be used for groups with multiple concepts that have identical menu item names. 5) Sales Account Separation - Sales Accounts are imported from the POS System and reflect the Service Type and Category of the Menu Items that appear on Sales Tickets. Sales Accounts must be mapped to a GL Account and assigned a Sales Account Type for DSS review. Note: Changing this setting after the initial POS Mapping has been completed will result in new Sales Accounts being created. These Sales Accounts would then need to be mapped as previous Sales Accounts would no longer be in effect. Additionally when a setting other than 'None' is selected, changing the Legal Entity or Location Name will result in new Sales Accounts being created, requiring each new Sales Account to be mapped. Legal Entity - Each Sales Account will have the Legal Entity Name added to the middle of the Sales Account Name. For example: 'Dine In - Food' would become 'Dine In - Legal Entity Name - Food' etc. Location - Each Sales Account will have the Location Name added to the middle of the Sales Account Name. For example: 'Dine In - Food' would become 'Dine In - Location Name - Food' etc. Day Part - Sales Accounts will be broken out by Day Part. Each Day Part for each Location will have its respective Sales Account.